Fancy Free, the first solo album from singer and songwriter Robert Rex Waller Jr., takes the alumnus and associate professor (teaching) of writing in new directions — both musically and follicly. 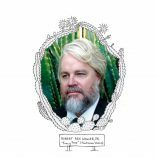 Looking at the photograph of a bearded Robert Rex Waller Jr. gazing serenely out of a frame of intricately drawn cactus on his new album, Fancy Free, one’s eye is drawn inexorably to his hair. 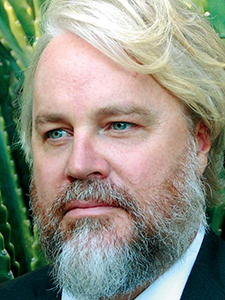 While Waller’s country musician beard is graying handsomely, in a traditionally manly manner reminiscent of, say, Kenny Rogers, his hair is … well, unusual. Perhaps best described as platinum blonde, it has a certain bouffant quality more reminiscent of another impeccably coiffed country music star — Dolly Parton. The overall effect is arrestingly cool. But Waller’s striking hairdo is not a tribute to the Nashville bombshell of “Jolene” fame, but to another Tennessee bombshell: his mother, Sarah Pickens Waller, a former French teacher, who died in March last year while Waller was recording the album. Waller, who earned a master’s in professional writing from USC Dornsife in 2003, is best known as the lead singer and a principal songwriter of his band I See Hawks In L.A. But with seven Hawks albums and a decade of touring under his belt, he decided a few years ago that he was ready for something different. Alumnus Robert Rex Waller Jr., associate professor (teaching) of writing. Photo courtesy Robert Rex Waller. Waller, who teaches writing to visual and performing artists at USC Dornsife, said part of his inspiration to make the album came from his students and their energy, commitment and ability to take risks. The album also derived from a more personal place. While recording last March, he got a call that his mother was seriously ill. She died 10 days later. The new album is in large part a tribute to her. “It’s called Fancy Free,” Waller said “The free part of the title refers to the theme of freedom and exploration, which a big part of this project for me. But the fancy comes from my mom. In terms of performance, she was a big influence. The kaleidoscopic range of songs on Fancy Free goes from The Kinks’ “Waterloo Sunset” and Neil Young’s “Albuquerque” to the delightfully bizarre title track from The Oak Ridge Boys, while Nina Simone’s “Don’t Pay ‘Em No Mind” with its melding of blues, jazz and country contrasts with Waller’s rocking cover of Bob Dylan’s “She Belongs to Me.” The album’s more traditional roots are wrapped in bursts of indie rock, jazz, punk, and 70’s psychedelia. Does Waller have a favorite track? 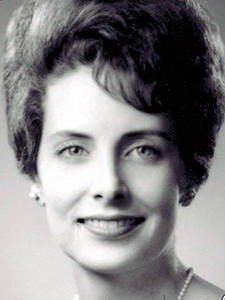 Robert Rex Waller’s mother, Sarah Pickens Waller, who died while Waller was recording Fancy Free. Photo courtesy Robert Rex Waller. The album has a family feel to it. Not only did Waller’s father, Robert Rex Waller, play piano on the disc, his wife, Katie Williams, sang harmonies on the album’s version of Daniel Johnston’s “Don’t Let the Sun Go Down on Your Grievances.” Williams also did artwork for the sleeve, while their son, Henry Waller, provided the cactus drawing on the disc label. The album also features Waller’s former student Nora Germain on violin. Waller’s class helps students explore or discover their own artistic values through the process of writing, sometimes about their own work. Waller uses his own art experience in his teaching by exploring his own creative process though writing and then modeling that for his students. Waller tells students to find a story you want to tell, know why you want to tell it and figure out what you need — whether money or equipment — to get from your idea to the finish line. Fancy Free comes out on CD on July 1. Waller will perform a CD release show at Pappy and Harriet’son July 2.